Treasure and danger await in the depths of the Earth. Will you dare enter the Dungeon? 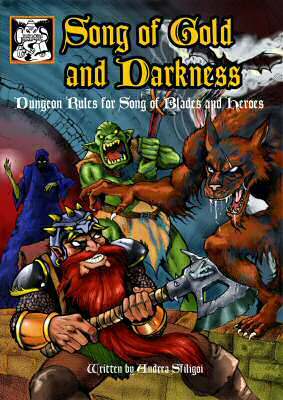 Song of Gold and Darkness is the first expansion for the popular Song of Blades and Heroes tabletop fantasy skirmish rules. rosters for 156 new monsters and warriors, including Dark Dwarves, Dark Elves, Hobgoblins, Snakemen, Giants, Angels, Demons, Were Creatures, and classic dungeon dwellers such as Brain Devourers, Eye Monsters and Gargoyles.